Spring Cleaning Guide for Your Florida Home | 1st Residential Funding Inc.
Spring in Florida arrives early and it brings the site of bright yellow flowers and trees! 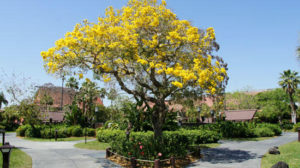 The showy tabebuia tree announces springtime in Florida, with varieties that flower in pink, lavender-pink, and its signature yellow. When you see the yellow blooms, that is a signal to begin Spring Cleaning! What should be on your list to do in the next month in order to prepare the inside of your home? Start with a clean sweep of your home, getting rid of items you don’t use or do not fit. According to Maria Kondo, author of The Life-Changing Magic of Tidying Up, the question to ask whenever deciding whether to keep or toss an item is this: “Does this bring me joy?” If it does not, place it in the “Donation” box. Now that your space is decluttered, start with a hot water wipe-down of every surface in your home. This includes walls, baseboards, fans, and appliances. Next, use a deodorizing and disinfecting formula to deep clean each surface. We recommend a simple mixture of water and vinegar (2:1 ratio) for most surfaces, but for a complete list of deodorizing tactics, check out Good Housekeeping’s article. Once the outer surfaces look and smell good, let’s tackle the inside. This includes appliances such as the dishwasher, oven, microwave, stove, and refrigerator. If you use shower curtains, as opposed to shower doors, get rid of the inner curtain now and replace it. For less than $3.00 you can replace the mildewed curtain in your bathroom. Remove all blankets, pillows, stuffed animals, and comforters. Many of these items can simply be washed in a traditional washing machine while others will require dry-cleaning. Dust and allergens in your home are often caught in curtains and rugs. So, Spring is a great time to shake those mites out! Finally, shine your home until it sparkles by cleaning those windows and carpets. This will give your home that “brand new” feel we all crave. Do you have any tips or additions to our list? Leave a comment to let us know what our Florida homes need! Happy cleaning!